HHO Dry Cell Kit DC1500. Save fuel & reduce emissions. CE certified unit and easy to Install. No modification to engine components required. SAFE - no hydrogen storage. Produced as required by Electrolysis of water. 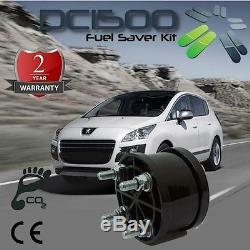 HHO-Plus DC1500 Kit for petrol, diesel and lpg cars. Turbos and fuel injection models. For larger vehicles, including vans, trucks and off-road vehicles up to 16 litres please see. How Does Hydrogen Gas Work in your Car? If our fuel burned to completion all of the time we'd just get carbon dioxide and water vapour coming out of the exhaust pipe with no smoke, particulates, hydrocarbons or carbon monoxide so t. Here would be no need for diesel particulate filters (DPFs), EGRS or catalytic converters. But we know these are fitted so why? Combustion of fuel is incomplete and. The amount of fuel energy wasted varies according to the engine conditions such as its speed, temperature, air temperature, humidity and load. O meet emission requirements partially-burned fuel in the exhaust is trapped as carbon soot (in the diesel particulate filter, DPF) or burned by the catalytic converter and that component of fuel energy is just wasted. Deally that energy would be released in the combustion chamber to power the crankshaft. In the HHO cell, an electric current passes through water to split the water by electrolysis into its components, pure hydrogen and oxygen gases, often referred to now as HHO. To allow electric current to flow easily an electrolyte (potassium hydroxide, KOH) is added to the water. 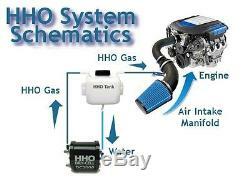 The oxygen and hydrogen gases are fed into the air intake of the engine. Ydrogen diffuses extremely fast and has a very fast flame front (about 3x the speed of fuel air mix) and serves as a combustion accelerant to help the fuel vapour burn more uniformly in the chamber under lean conditions giving improved thermal efficiency. Some people have likened it to using BBQ lighter fuel to light the coals, it doesn't replace the main fuel it just helps it to burn more uniformly and rapidly. Test reports in the following articles describe the results of HHO tests. Using the engines power to generate the HHO. Examples can be seen from a Google search for Science Direct articles. They conclude that HHO addition. Results in increased engine thermal efficiency, a reduction in fuel consumption, CO, HC and NO. He exhaust gas is also cooler. The publications reference numerous other HHO test reports and the. Beneficial effect applies to both petrol and diesel engines. Reduce your fuel cost by up to 30%. The savings will depend on the engine age, condition and driving style. Older engines tend to give the largest gains. Increases the power and performance in your car. Over time and with increased mileage deposits build up in your engine and power is gradually reduced. Once you switch to supplemental hydrogen, it will reduce deposits, enhance power and the performance of your car. Lower noise and vibrations in the engine. The engine will sound quieter than before due to higher combustion efficiency. If you have a question please check the FAQs further down this listing before contacting us. The hydrogen gas is generated from water on demand and is. It is also used at. And produced in small quantities only when the engine is running. Remember this is not a fuel substitute but a means to enhance combustion or your existing fuel, so only small amounts are required. When the engine is off, no hydrogen is produced. HHO-Plus cell units are CE certified with overload protection, flashback protection and are supplied with full and clear instructions on safe installation and use. For further details see the end of this posting. This kit comes complete with the following items required for the installation. Dry Cell HHO Gas Generator - Dry electrolysis cell with 11 plates in 316L stainless steel, corrosion resistant seals, heat-resistant materials (no acrylic), CE certified. Water reservoir (volume of 1 liter) with hose fittings, easy level check and opening for refilling. Purpose built vessel with inlet, outlet and drainage ports, internal pipe and hose connections. If a PWM with auto on/off is used (see my listings) the relay is not required. Electrical cable HO7V K, 6 mm section, in red and black, suitable for all electrical connections. Fuse holder and fuse 20A. Insulated Terminals and accessories for all electrical connections. High Pressure Hose for the HHO gas. Crystal PVC Hose for the electrolyte. Includes all the necessary connectors and sockets for the connections. IMPORTANT:- Please refer to the installation configuration recommendations below. Electrolyte - Potassium hydroxide (KOH). Extender for the lambda sensor - electronic fuel injection. Installation Manual in English, French, German, Italian andish. Note that if your engine has an ECU & OBD port then additional electronics are required as described. For other vehicles including trucks, vans and off-road vehicles please see our other listings. It is not suitable for hybrid vehicles. Before placing your order please send us your vehicle details including. 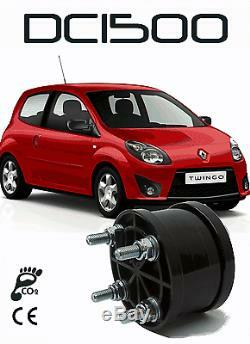 We also offer additional accessories which for some vehicles may provide further fuel savings. Note below that for some vehicles a MAF sensor enhancer or HEC chip is recommended in addition to the main kit. Please see the other listings. For overseas orders we reserve the right to add a surcharge to cover any additional carriage costs. Petrol Engines Carburetor (before 1992). Requirements: Kit HHO + Lambda Sensor Extender +. Requirements: Kit HHO + HEC Chip. Diesel Engines Mechanical Pump (before 1998). Requirements: Kit HHO + MAF/MAP Sensor Enhancer. The dates can change according to each country and manufacturers. Fuel savings will depend in part on the condition of the vehicle and sensors such as MAF and lambda sensors should be in good working order. Our products are designed and produced in the European Union at HHO-Plus Lda in compliance with technical standards and industrial manufacturing of such products. Construction materials of very high quality ensuring a long product life. Stable operating temperature of the generator and overload protection - no risk of overheating. For optimizing the performance of your system. By simply moving the position of terminals. Isolation of the cell to withstand extreme cold in winter conditions in order to continue to be effective even in the more severe conditions. Absence of brown deposits in the dry cell and electrolyte circuit. High system security based on a protective bubbler tank and valve. Technical Data and Additional Information. G enerator Type: Dry Cell. Voltage: 12V; Optimum operation current: 6-8 A. Standard electrical connections of the cell. + NNNN - NNNN + (N - neutral plate). Plates: 11; Total area for gas production: 670 cm2. Production of Hydrogen: Up to 1.0 liters per minute (12A). Advantages and Features of HHO-Plus Product s. The small size of our generators allows easy installation in all cars. The dry cell can also be installed horizontally or vertically allowing greater flexibility for the installation. Despite its performance, the cell size is relatively small in proportion to the quantity of gas produced ensuring optimum operation over time. Our plates are manufactured in 316 L stainless steel, laser cut, with a special chemical and physical treatment developed by our team to extend the operational life of the generator. You will not see brown deposits in our dry cells. The new nylon flanges have been developed solely for our generators. Good physical resistance and, above all, thermal resistance (melting point 190-350°C) makes nylon the best selection material for these products. As the generator will be installed in the engine compartment, where the temperatures inside in summer can be very high, the thermal resistance of the materials used is very important. This is why we dont use plexi glass or other materials susceptible to warping. We use special elastomers (temperature limits of use: -40 to 200 ° C), with a square section and large contact surface. Optimal distribution of pressure throughout the sealing surfaces. 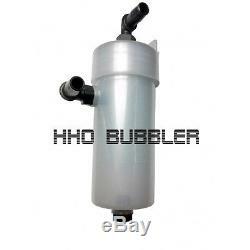 Bubblers serve two purposes - cleaning the HHO gas and acting as a safety barrier. When HHO gas is produced from a dry cell, some water vapor is produced as well. This water vapor can carry tiny particles of electrolyte which could cause damaging corrosion. As the HHO bubbles rise up the column of water inside the bubbler they are "filtered" of any electrolyte aerosols. The result is much cleaner HHO gas. In the event of a flashback, the bubbler acts as a safety barrier as the water column will prevent the flame from progressing any further. What are the fuel savings and advantages using our Hydrogen Technology? Reported savings up to 20% in fuel consumption with some users reporting higher savings with older vehicles. Hydrogen/oxygen reduces fuel consumption by assisting the carbon based fuel to burn more efficiently. Hydrogen also helps to clean carbon deposits from inside the engine. We employ this property in our high output engine carbon cleaners. This breaks the laws of thermodynamics. A common argument is that the energy required to produce the HHO by electrolysis is greater than the energy it releases in combustion. This is certainly true if hydrogen and oxygen were to be burned in isolation but they are mixed with the fuel air mix and their presence exerts a positive effect on the combustion of that mix. Researchers have shown that small amounts of hydrogen facilitate a faster flame front & energy transfer that assist a lean fuel-air mix to burn more efficiently in the. That results in more useful energy being extracted from the main fuel under lean-burn conditions where it is needed, with less residual fuel energy being wasted in the DPF & catalytic converter (those devices only exist because engines waste partially burned fuel). Than compensates for the parasitic lo. Ad required to make the hydrogen and oxygen. For further reading you will find online some HHO research articles by A. Bari; A Al-Rousan; El-Kassaby; and HHO review articles online which can be used as a source of further references. "Effect of Hydroxy (HHO) Gas Addition on Performance & Exhaust Emissions in Spark Ignition Engine - A Review" R. IJIRSET Vol 5, Oct 2016. Can HHO improve my vehicles performance? Yes, controlled engine tests carried out by researchers in numerous studies, using oxygen/hydrogen produced by electrolysis have revealed an increase in torque, bhp, reduced fuel consumption and reduced emissions compared to controls. This has been attributed to enhanced flame propagation caused by the high diffusivity and fast flame speed of hydrogen. Does it work with Diesel and Petrol vehicles? Yes, it works with diesel and petrol engines but is not recommended for hybrids. Does the hydrogen generator cause any short or long term harm to my engine? No, the hydrogen generator does not cause any problems to the engines. Although it is a lean burn results in studies. Have shown HHO supplementation results in greater thermal efficiency, with more mechanical energy and an exhaust gas with lower temperatures. What type of routine maintenance is involved? Filling the water tank with distilled water as needed. Every 1000 km you will need 1 litre of water and add little bit of electrolyte. Every six months, depending on amount of use, it is recommended to drain and flush the system and replace with fresh distilled water and electrolyte. What is the electrolyte used? The best electrolyte is KOH (Potassium Hydroxide). Very cheap and easy to find. Some is supplied with our kits. Will the water in the unit freeze in winter? No, if you add about 20-25% of isopropyl alcohol to the reservoir solution to avoid freezing in winter months. What if I dont use Distilled water in my generator? Distilled water is basically pure water. Other types of water like tap water, mineral water, pond water, sea water, etc. Will work in the short term but they will also quickly cause the electrolyte to become muddy due to the minerals and impurities in the water. Mineral deposits will build up on the generator plates and act as an insulator causing Hydrogen gas production to suffer. Can the hydrogen generator explode? The hydrogen production is made on demand. You will have hydrogen only when your car is moving. Unlike pressurized gas tanks, there is only a small amount of hydrogen pressure in the system. Refer to the safety information before fitting. If I have questions is there any tech support for my Hydrogen Generator? In case of an accident will the Hydrogen Generator blow up? Absolutely not, all you will have is water and electrolyte on the ground. Can we use the Hydrogen Generator on a power generator? The Generator can be used on any power generator. What is the products life? Is a hybrid fuel system more prone to rust or corrosion? The water vapour formed during combustion exits the exhaust system. Water vapour is a normal constituent of fossil fuel exhaust gases. 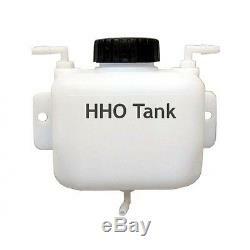 Can I use a bigger HHO model in my car? Yes, we offer a range of models in keeping with the ranges of engine sizes but if preferred you can use the next model up. The fuel savings will be not much higher but the life of the generator will increase a lot. For the small price difference between models maybe it is a good investment. What safety devices are in the kits? 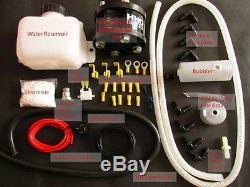 We have included in the kit a bubbler and a non-return check valve to prevent any damages if the engine backfires. 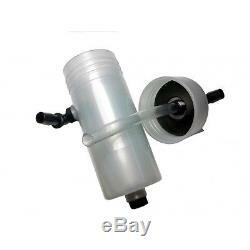 The bubbler will also serves as a barrier to traces of electrolyte vapour from the gas being sent into the engine. Can I use any kind of water? It is recommended that you use distilled or de-ionized water. You can use tap water. If it is a soft water supply, but as with a kettle or iron, limescale deposits may form and reduce the life of the unit. Continuous use of tap water is false economy and should be avoided. How often do I have to check the water level in the tank? Check it about every time you fill your car with a full fuel tank. It is an add-on device that can be easily removed. As a precaution we recommend that check with the supplier of your vehicle before purchasing an HHO unit. My car doesnt have much space under the hood. Where can I install the HHO System? Many engine compartments have limited space but on closer inspection people generally find there is some place a unit can be installed. Our Hydrogen generator is the smallest on the market, the size of a motorcycle battery. The best place is in front of the car under the bumper. How much would it cost me to have a mechanic install this? Installation to your vehicle can be easily done by any good mechanic, or by yourself. Mechanics normally like the idea and respond well once they see the installation instructions. 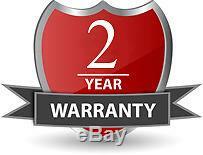 Installation depends very much on your vehicle and the hourly rate of your mechanic. However we can estimate your installation will take between 1,5 hours up to 3 hours. When do I get my instructions manual? Does HHO injection work on vehicles with Turbo? HHO works in turbocharged engines. Just make sure to inject the HHO gas before the turbocharger, not after. Do I need any other parts? The kit is supplied with an electrical relay which is connected to the ignition switch circuit but it is easier to install the electrics if a PWM30 or PWM60 current controller (see my other listings) is used. They link directly to the battery yet still give auto on/off when the engine starts/stops. The relay and its connection to an ignition switch circuit then can then be ignored. The current to the HHO cell can be controlled by altering the electrolyte concentration but the PWM current control units provide a much more elegant way to provide control at a fixed electrolyte concentration and so are recommended. Please see the PWM30 and PWM60 listings. The PWM60 features inbuilt digital voltmeter and ammeter for ease of use. The PWM30 requires the use of an external digital ammeter (connects across the PWM fuse socket) See the separate listings for full details. HEC or MAF Sensor enhancer option. Older vehicles without an ECU or OBD diagnostics port or MAF sensor wont need an HEC or a MAF sensor enhancer. However if your vehicle is more recent than 1995 and/or if it has a MAF sensor (between the engine and the air filter) please see the HEC and MAF sensor enhancer listings for a description and explanation. The amount of hydrogen produced on demand is small but please note the following. Hydrogen is a flammable gas and can form explosive mixtures with oxygen or air. Hydrogen gas poses an immediate fire and explosive hazard when concentrations exceed 4%. It is much lighter than air and burns with an invisible flame. Before working on an installed HHO system ensure to extinguish all sources of ignition, naked heat including sparks or flames disconnect the vehicles battery terminals and take precautions to eliminate static electricity. No smoking near the generator or its reservoirs at any time. HHO generators produce HHO gases on demand when the engine is running but when disconnected there will be residual amounts of HHO gases in reservoirs and tubing. Allow units to vent thoroughly outdoors or in a well ventilated area before working on the units or accessories. HHO-Plus Lda and HHO-PlusUK do not accept liability for damages or injuries or for any direct or consequential loss caused by the improper use, alteration of units or maintenance of HHO-generators or accessories. HHO PLUS - Alternative Energies, Lda. ("HHO-Plus") whose head office is at. Before attempting to fit any HHO-Plus Product the Customer should seek professional advice from a trained automotive mechanic and automotive electrician. Any advice offered to the Customer by HHO-Plus and/or HHO-PlusUK is done so as a gesture of goodwill and with best intention and should not be considered to be an alternative to seeking professional advice prior to installation. By purchasing the Products the Customer does so on the understanding that installation and use of the Product(s) is done so ENTIRELY AT THEIR OWN RISK. This statement does not affect your Statutory Rights. Of an HHO-Plus Lda approved Distributor, Luton UK. It is an offence to: - c.
Ent, lend or issue copies of the work to the public; p. Erform, broadcast or show the work in public; a. DC1500 Dry Cell HHO Kit for cars & motorbikes" is in sale since Monday, February 22, 2016. This item is in the category "Vehicle Parts & Accessories\Car Parts\Air Intake & Fuel Delivery\Other Air Intake & Fuel Parts". 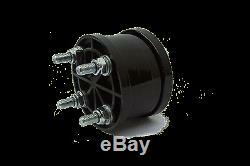 The seller is "carboncleansystems" and is located in UK Distributor/Support. This item can be shipped to United Kingdom.